My education was interrupted when I received my Army Draft Notice in June 1967. This was during the height of the Vietnam War. At the time I was extremely disappointed in being drafted. However, this proved to be one of the greatest highlights of my life. Marlene and I had mutual friends throughout high school and college but never had talked or hung out before our final year at the UA. Our last year we began talking more and found out we had things in common than just mutual friends. My now wife and I met through a campus ministry group her freshman year and my senior year. We didn’t interact much at first. She was a part of a Bible study group I led of freshmen girls who met for breakfast once a week. When I was a 1st Semester Junior in the business school I had to take a class called Logic, inductive and deductive reasoning. I was trying to improve my GPA so I was sitting in the first row. I saw Myriam coming down the stairwell at the Student Union. I recognized her from an introduction 2 years prior and hadn't seen her since then. I said hi and asked her where she was going. 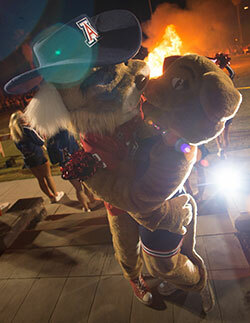 I DID meet the love of my life while we were both students at U of A! I had transferred to U of A after having traveled two years with Up With People and Jim had transferred back to U of A after time in New York so we were both slightly older students. It was love at first sight! We met in 2012 at the Houston BayouCats Territorial Cup Watch Party when Rebecca decided to randomly sit next next to me and for the next four hours and engaged in our love for the Wildcats. Terry and I met in the U of A longboarding club called AZ Push in January of 2012 outside the Nugent building where the club meet every Monday and Wednesday for "Skate Night." Jared and I were both selected as members of the Bobcat Senior Honorary in April 2015.